350g low hydration sourdough starter (80% – fed at a ratio of 80g water to 100g bakers flour). Starter should be ripe and bubbly before you start. The basic instructions are here, although this larger amount of dough nearly filled my 90cm tray – you might need to divide it between two trays if your oven is smaller. Sourdough focaccias are always a bit addictive, but this pumpkin seed oil flavoured one was particularly moreish. They’re an occasional weekend bake for us – too high fat for everyday eating and too large to eat on our own, but perfect for sharing with the neighbours! 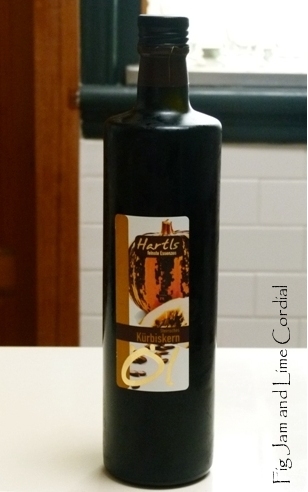 I too was given a bottle of Pumpkin Seed Oil, and fell in love. I love this recipe–will be trying it! Thank you. Hope you enjoy it, it’s such a lovely oil! Your neighbours must count their lucky stars to be living next to you! I was thinking of using pumpkin seed oil to flavour those spring onion flat breads which I have been meaning to make for such a long time now. If you say it’s moreish then I really must give it a go! Selma, that’s a fabulous idea, I love those spring onion pancakes! Good morning Celia, this focaccia looks and sounds delicious! As soon as I’m back on my feet, baking will be the first order of the day! Have a good week, love. Great post! I really enjoy reading the recipes online and always feel amazed at various delicious foods all over the world. I come from a different culture, so not familiar with focaccia, but am strongly interested in trying to make different kinds of gourmet food myself. Yum – I’ve never tried pumpkin seed oil, but you’ve got me curious. I’ll have to hunt some down. Thanks hon, you too! Hope you track some oil down! Sounds delicious! I don’t have pumpkin seed oil but I picked up butternut squash seed oil once while on vacation, this looks like it would be a great use! Tandy, they’re a fun and easy way to mix up the flavours a bit! I use duck fat and lard in some of my breads as well! I’m still yet to make one of your sourdough foccaccias Celia. I really must change that! I have masses of macadamia oil in the pantry I wonder if they would work. Once again… oh how I wish I was your neighbour. Claire, I reckon that would work brilliantly! What a great thing, to have masses of maccie oil! Lorraine, it’s great stuff to use, and really interesting – it comes out such a dark green that it’s almost black! Hi Celia, lovely as always. It looks delicious. I haven’t tried pumpkin oil but I have some walnut oil – do you think that would work in this recipe? Incidentally, that looks a little like the inside of a proper ‘stottie’ from Northumberland. Kim, yes, I reckon walnut oil would be delicious! And good to know that’s what a stottie is supposed to look like! P.S. My bread rising like an aussie loaf in the heat today! Look at that perfect foccaccia – I’m jealous! Thank you! Lots of practice on this one – the boys used to take slabs of it to school when they were younger, so I was baking it all the time back then! Isn’t it extraordinary that oil can be pressed from a pumpkin seed – no wonder they are so nutritious. Your focaccia looks so beautiful. I love focaccia but, like you, only make it when we have company because I would become a focaccia blimp in the sky – no self discipline you see. Jan, it’s a bit too delicious, isn’t it! :) Have fun with the juggling! And thank you so much for the link to the balloon juggling balls, I’m going to do that this weekend. It is a huge foccacia! Best for sharing…with ME! Lol! I can smell the goodness of it freshly baked :). What a good use for the oil! I had a bottle years ago and didn’t really know what to do with it and found that it didn’t emulsify very easily when I used it for vinaigrette but I probably gave up a bit soon with it.Maybe I should mix it with a machine? I bought a bottle of argan oil last year, and tried it out on various things like the oven kale crisps and my dry skin, made me smell very nutty! Mind you I am a bit. nutty. Good to know the pumpkinseed oil tastes good after baking, it is such a wonderful colour! and the bread looks a delight! Tell me do they grow olives in Australia and press oil? Yes, we do grow and press a lot of olive oil locally, but not sure about pumpkin seed oil! And I’ve been looking out for argan oil – is it delicious? We’re only just able to buy it here now.. It is nutty and warm and I think fairly new here too. Quite expensive, not sure if I would call it an essential, best thing would be to find a deli which offers tastings. Oh the flavor in this must be just terrific! What a delight. I absolutely love sourdough focaccia! Yum, yum, yum – yes please. Such a big fan of focaccia! The uncooked dough looks so beautiful and pleasing. The toasty flavour this oil must add to the bread…..mmmm ….I shouldn’t read posts like this before breakfast.